Residents across the United States are bracing themselves for a record-breaking cold front. In Northwest Arkansas, temperatures are hovering around 0 degrees Fahrenheit, with a high of 13 on Monday. Thankfully for the Duggars, snowfall has been minimal, and meteorologists are predicting above-freezing temperatures for the rest of the week. How is the weather in your area? -24°f with a wind chill of -54°f in NW Minnesota!! Here in CO it is now -8! My name is Krysten and I live on a farm in Saskatchewan, Canada. We are about an hour away from the U.S. border. My family enjoys watching your '19 Kids and Counting' shows. Right now in our area of South East Saskatchewan, we have around two to three feet of snow and the temperature has been -50 degrees Celcius with the wind chill which is -58 degrees Fahrenheit. Those temperatures are not normal. -13 degrees here. Hot Cocoa and Hot Cider day for sure. Love your show. It's bitter cold in ND right now...-22 with a brisk wind, so feels like -50. No one ventures outside unless absolutely necessary! Im living in the Netherlands so we don't have snow yet. I hope that it wil come soon!!! Hoping the Duggars are enjoying it !!!!!!!! In OR its cooled but not snowing. It got to -5 the other night here in boston also got 19 inches of snow ! I live in wy, it's warmer than usual. It's usually cold and windy. Around negative ten degrees! Resulting in two days off from school! Yay! Are the Duggar girls wearing pants??!!!??! It's FRIGID! -10F Wind chill here near Bartlesville, OK. We've had a lot of snow dumped on us too over the last month. I live out in California, and it has been bone dry for almost one full month. Everyone has literally been doing rain and snow dances for a couple of weeks now. I think they are but I'd like to get a confirmation... does anybody else know? I live in Germany, Europe and am missing the snow somehow :) that's a kind of irony, isn't it? But I have pity on you for the heavy snowfall and the cold temperatures. Here they are safe above zero degrees celsius. In the Chicago area it's negative 13 degrees and the snow is drifted up just below our window panes. A great day to remind the children of how Christ's blood washes us as white as snow :). I live near the Duggars and let me tell you it is COLD!!!!!!!!! -11 with a windchill of -30 here in our small town in Indiana!!! Def the coldest I've ever seen! It's warmer in Alaska than here right now!! Lol. But supposed to get up to the 40's by the end of the week. Here in the eastern panhandle of WV its definitely frigidly freezing lol. Its 7° right now and they're calling for -5° tonight. They've already cancelled school for tomorrow for our little ones. The wind is unbearable outside right now. Stay safe and warm Duggars. God Bless u more everyday!!! I live in Germany in a town near Cologne and today it is +12° Celsius, nice clear day and no rain. More spring than winter here. So it is somehow hard to imagine a cold like yours. I have heard, that it might snow later this month though in my part, that is. 20 to 30 degrees here in north TX!!!! i am afraid to let my dog out at night its was 17 for awhile and the windchill is -6. not as bad as the Ice storm a couple of weeks ago, but still VERY cold!!!!!! I live in South Africa we have warm and sunny weather right now but not too hot on weekend we had rain. Of course they're in snow pants. What else are they going to wear? A snow skirt? That'd be very cold. It looks like Joy swearing snow pants but I'm not sure about Jennifer Hartono she might have a skirt over pants. It's not unusual for them to wear pants for activities such as sleigh riding. Yes, they're wearing pants:) it would be very cold without them. We wear skirts in our family, but we are allowed to wear snowpants outside in the snow. Just if we go inside we have to change. it is -42 windchill here in North Dakota. At our side of the globe it has never been this warm on a 3rd january since they started writing down the temperatures. 15 degrees celcius! that's about 60 F. Normally we have freezing (25f) at nighttime and max of 5 c at daytime (40F). We live in Nauvoo Alabama and the weather here is crazyy , we have winter and summer in one week here , !! I member when i was a little girl that it was comming torandos one day and 70 plus deg than the next day there was snow on the ground !! so u really never know bout the weather here , if u ever visit just make sure u pack a big jacket and sum flip flops hehehe! Cold, cold, cold, cold, cold here in WI, though it is starting to warm up a bit! It was 55 to 70 degrees here in Goleta Ca. 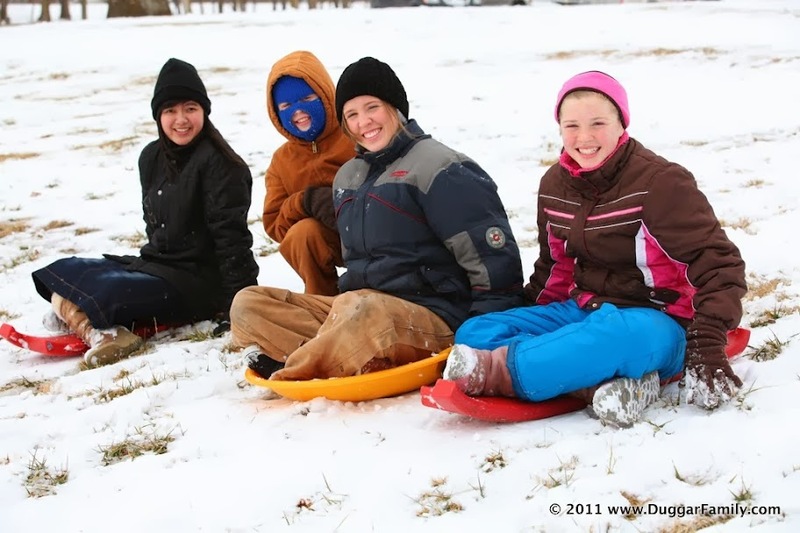 I hope the Duggars are enjoying themselves in all that snow! I'm hoping it will snow here before Christmas, but it doesn't look likely. It was around 3 degrees today, but apparently it snowed near Scotland, so we shall see. The sun set at 4 as well today, so it's cold and dark. I hope everyone else is enjoying their weather while we look forward to rain tomorrow, fun! 5 degrees in Upstate NY. I want it to SNOWWWWWW!!! !